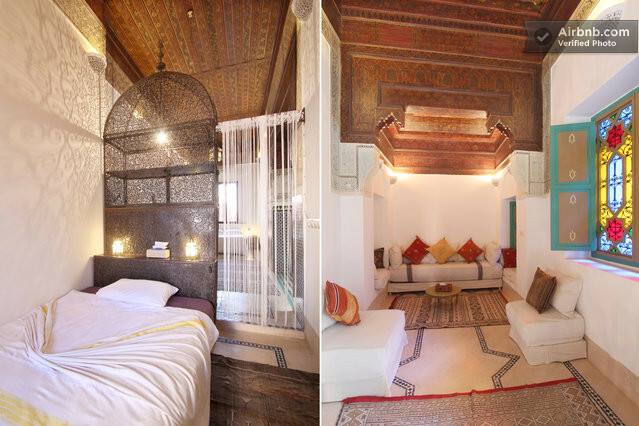 Riad LakLak is a gorgeous Riad from the 17th century. 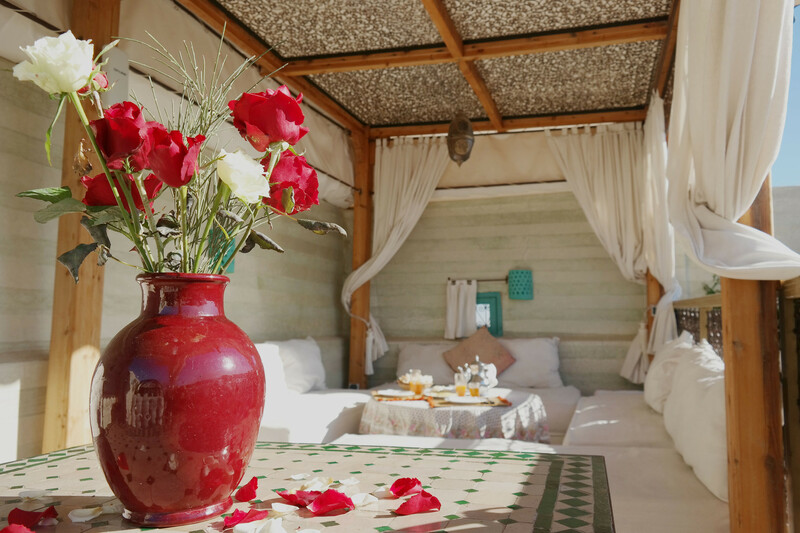 It is located between the "Palais Bahia" and the "Palais Badii" in one of the most authentic area of the Medina of Marrakesh. 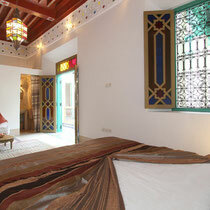 The famous Jemaa El Fna Square is only few steps away. 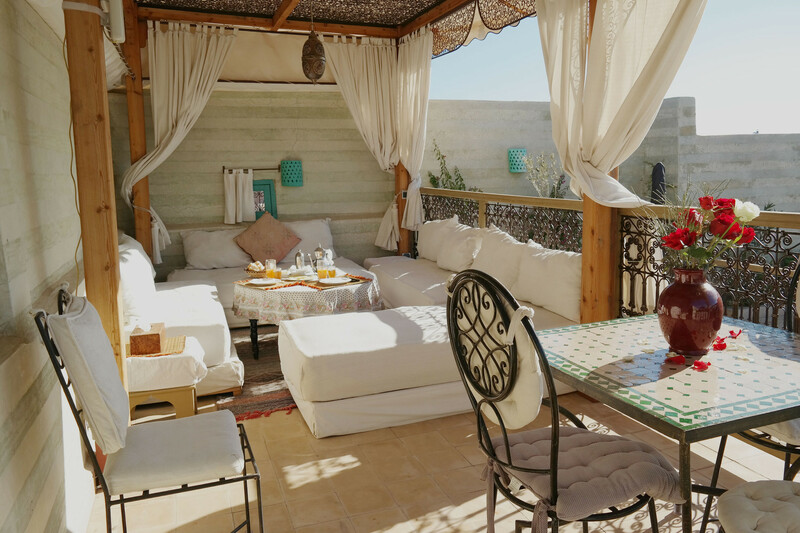 On the roof terrace, you can watch at least a dozen majestic storks nesting on the walls of the atmospheric and beautiful ruin of the Badii Palace. 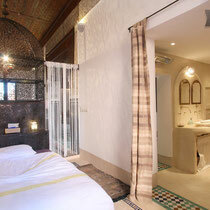 Storks are the harbingers of happiness and prosperity and have given Riad LakLak (Riad Stork in Arabic) its name. 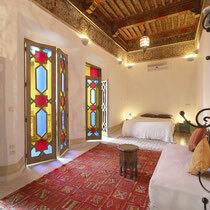 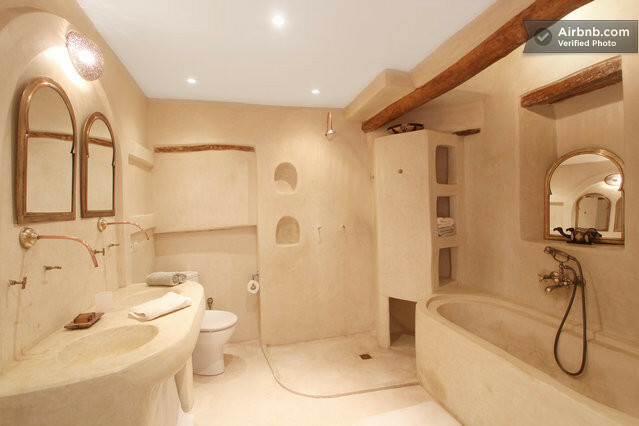 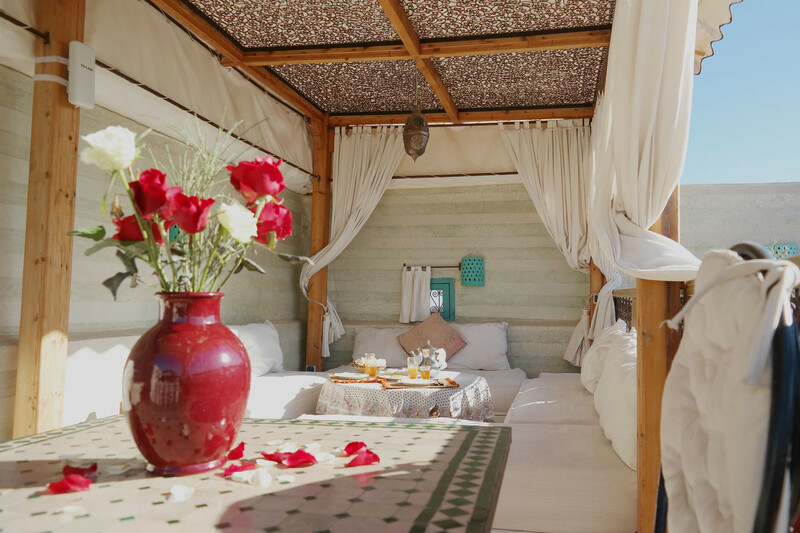 Riad LakLak has two suites and five bedrooms and can accommodate up to 16 persons. 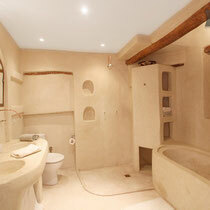 The daily price of 180€ is for the entire house for up to 4 persons. 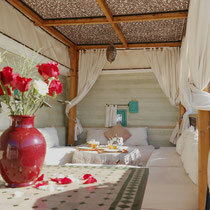 Each additional persons above 4 is 20€ per day. 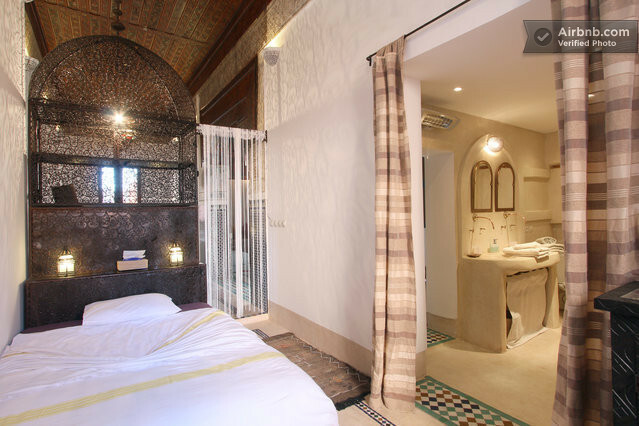 LOCATION: The house is centrally located between two famous ancient palaces -- the «Palais Bahia» and the «Palais Badii» -- in one of the most authentic areas of the Medina (old city) of Marrakesh. 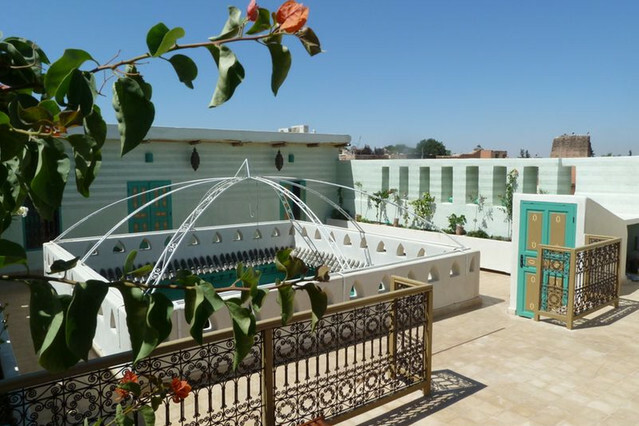 The famous «Jemaa El Fna» Square is only seven minutes away and a guarded car park, where you can easily get a taxi to discover Marrakesh and its surroundings, is located close by. 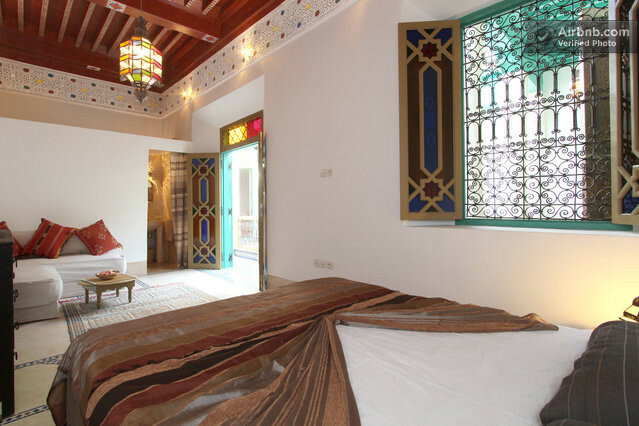 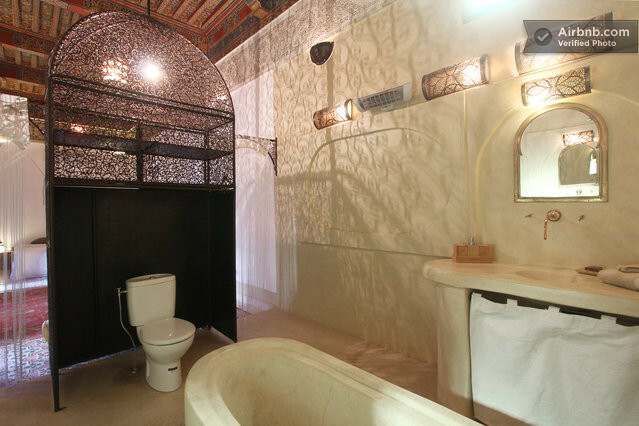 THE HOUSE: This riad from the 17th century was recently renovated with traditional Moroccan construction techniques. 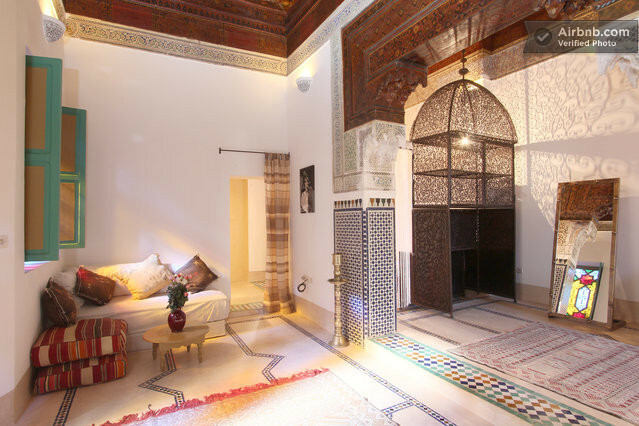 Examples of Moroccan handicraft, such as Tadelakt (Moroccan wall painting technique with colors), sculpted plaster and wooden ceilings are found in every room. 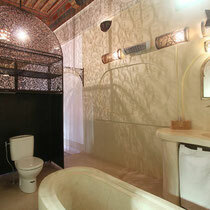 Lamps, furniture, mirrors, bedspreads, curtains, etc. 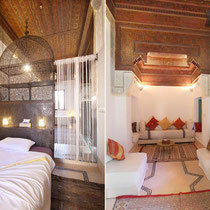 found in the riad have all been crafted by Moroccan artisans, some of them living next door. 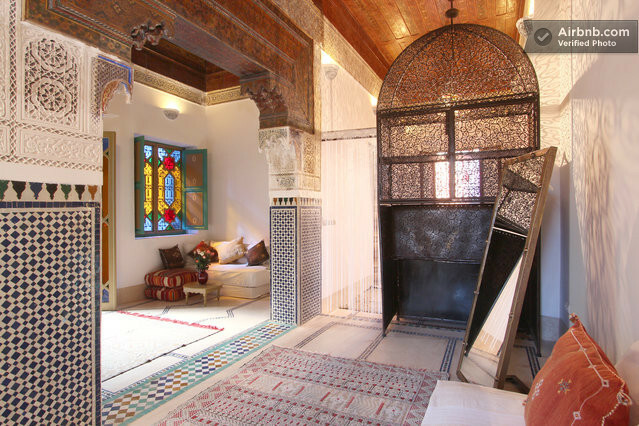 Click here to see Riad LakLak on google maps. 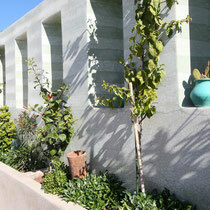 Opening Hours: Monday through Sunday, all day. 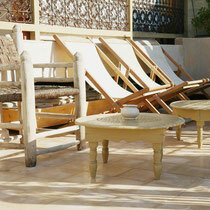 From 180€/day for the vacation rental. 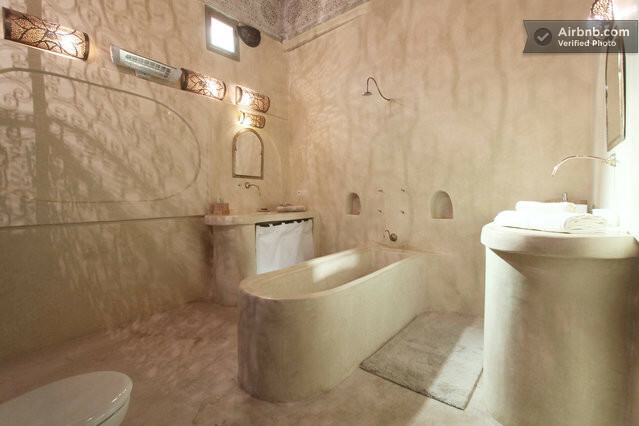 Rated 4.9 stars - based on 62 reviews on AirBnb. 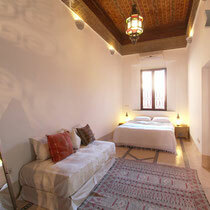 Riad vacation rental in the Medina of Marrakesh. 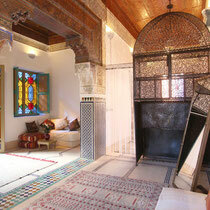 Accomodates 16 persons. 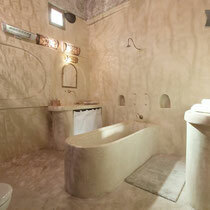 From 180€/day. 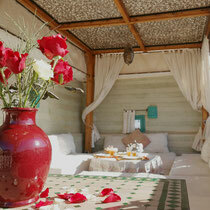 Perfect for anniversary, family gathering, seminar, retreat. 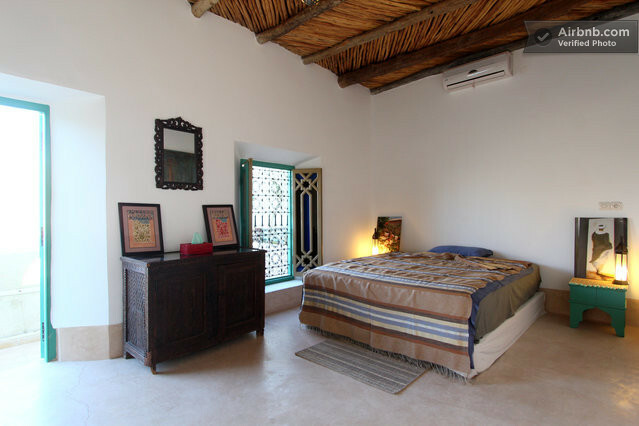 HOUSEKEEPER: A French and English-speaking housekeeper has a bedroom in the house. 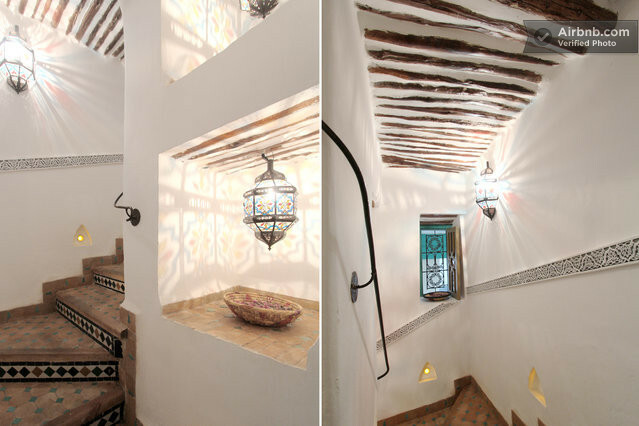 He has his own entrance to the house but he shares the staircase. 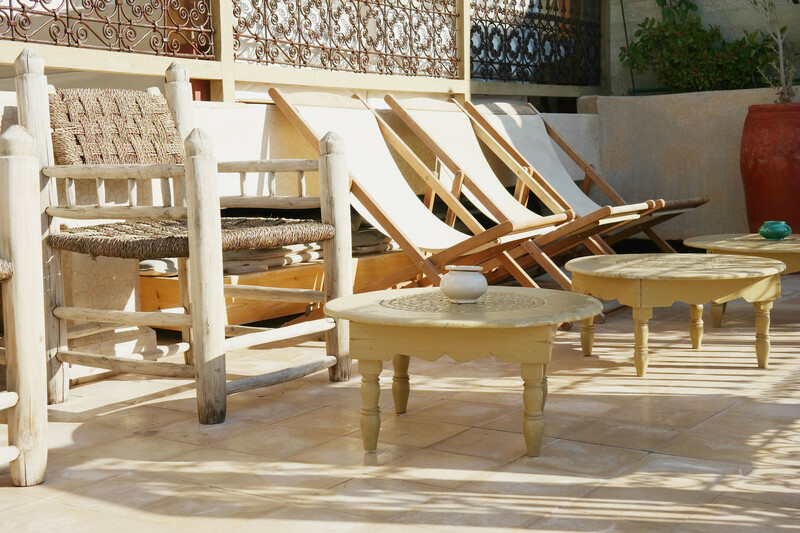 He is available any time during your stay to assist you and make sure you are enjoying your vacation. 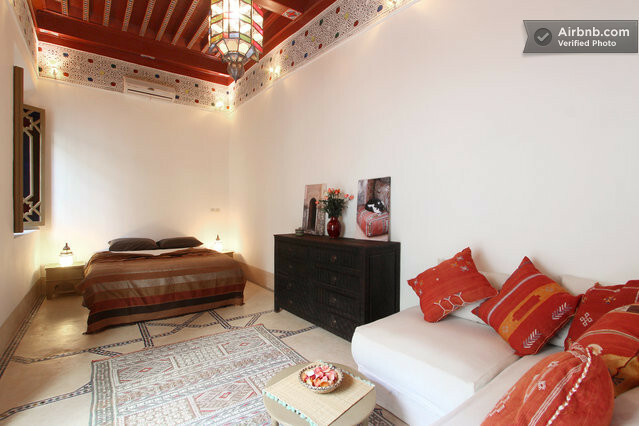 A French-speaking cleaning-lady comes in regularly to clean the main areas and, if you wish, can also clean the bed rooms at no extra costs. 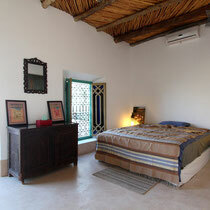 ROOMS: The total surface of the house is about 400m2 and it can accommodate up to 16 persons in 8 beds. 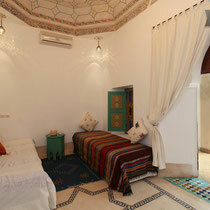 The dining room, a large kitchen, a Moroccan chill out area (bouh) and two bedrooms are located on the ground floor. 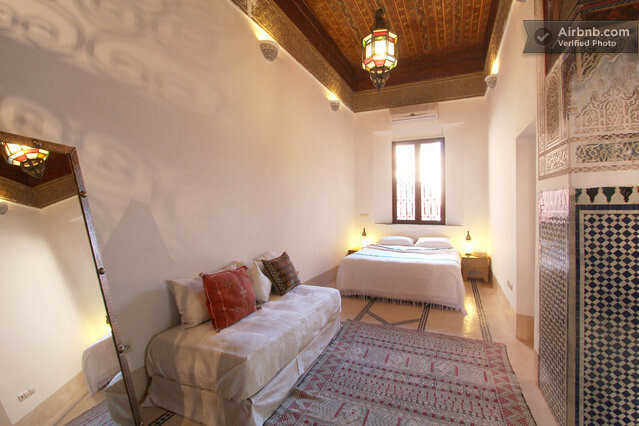 Two large suites of about 50m2 and a large bedroom are on the first floor, while an apartment with two bedrooms is located on the roof terrace. 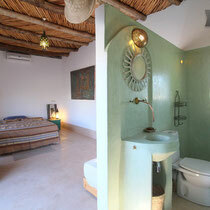 Each bedroom and suite has its own bathroom and is equipped with reversible air-conditioning. 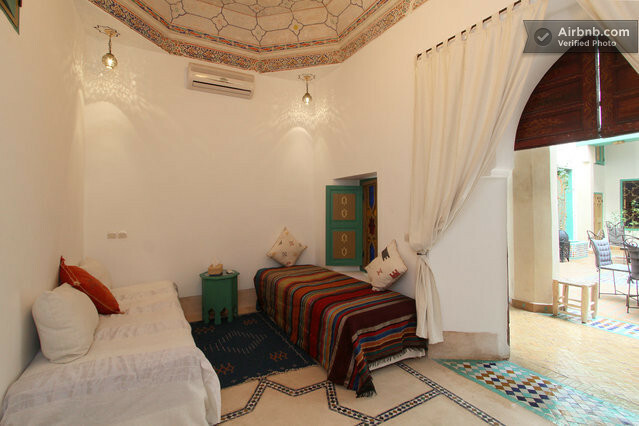 Two bedrooms each with a double bed (160cm × 200cm and 160cm × 200cm). 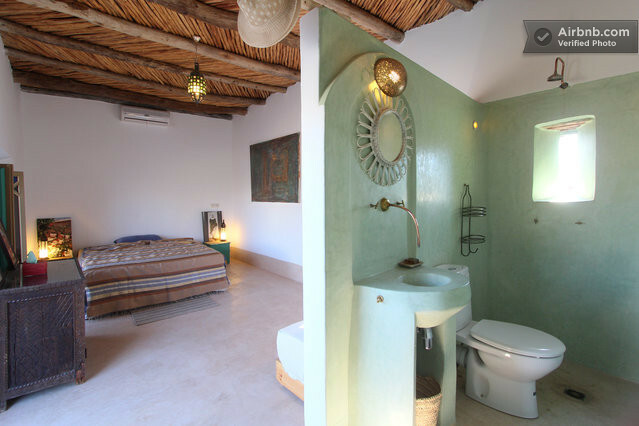 There is only one bathroom for these two bedrooms. 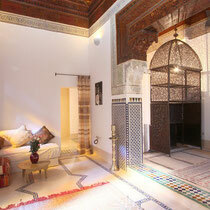 LIVING OUTDOOR: a large patio with two fountains and four orange trees occupies the ground floor. 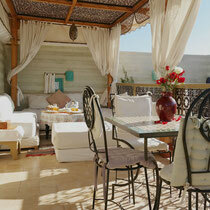 On the first floor, there is a chill out balcony with a view on the patio. 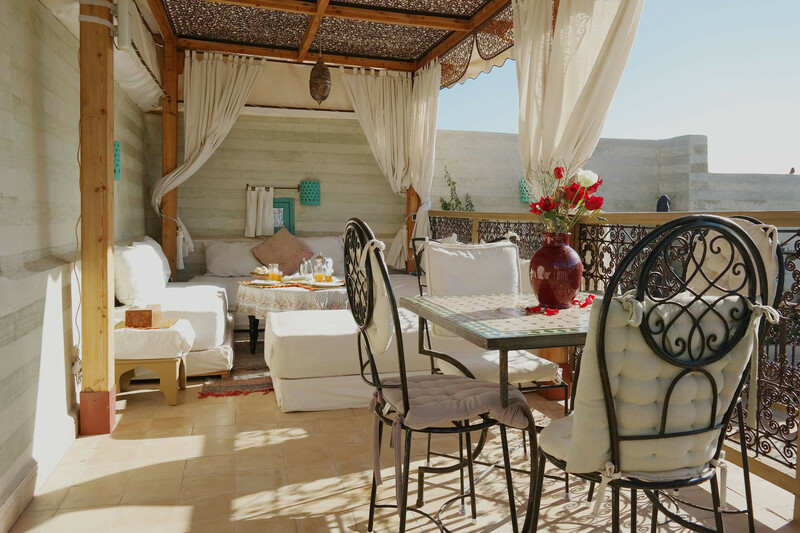 On the top floor, the large roof terrace of about 200m2 is the best place to enjoy the sunshine during the day and the deliciously breezy evenings of Marrakesh. 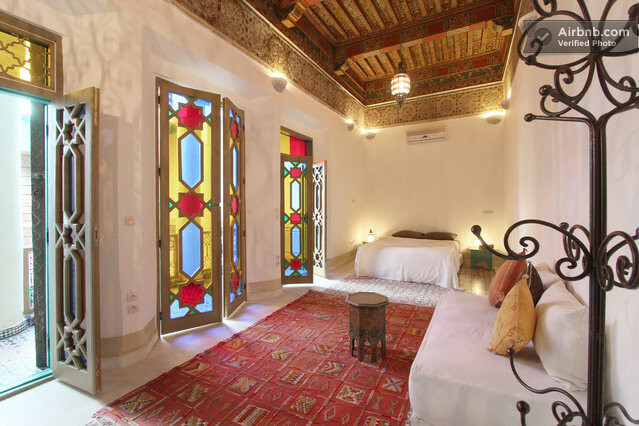 This is a place for relaxation and meditation, where you can watch dozens of storks nesting on the nearby walls of the «Palais Badii». 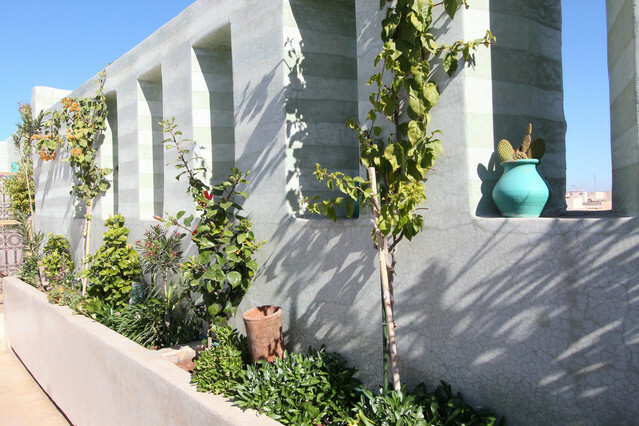 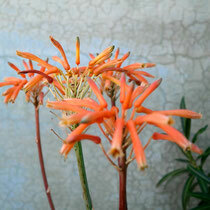 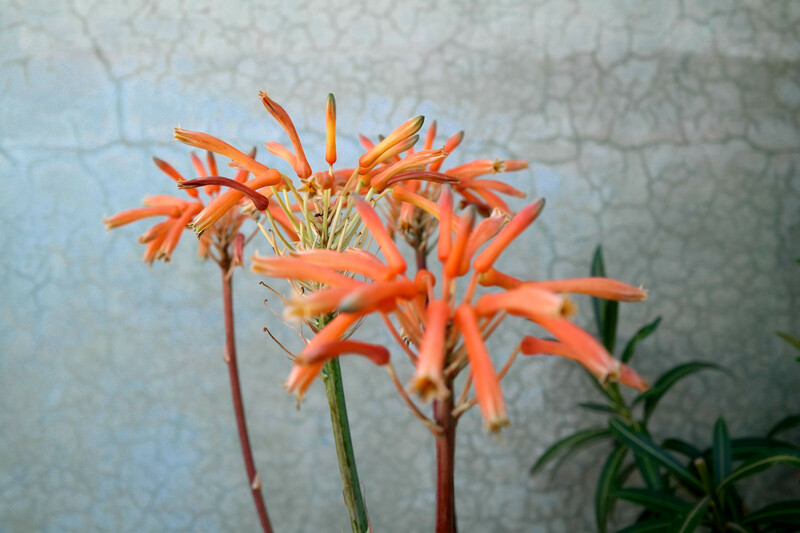 All plants found on the terrace and in the patio are typical of Morocco. 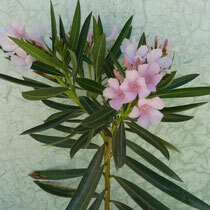 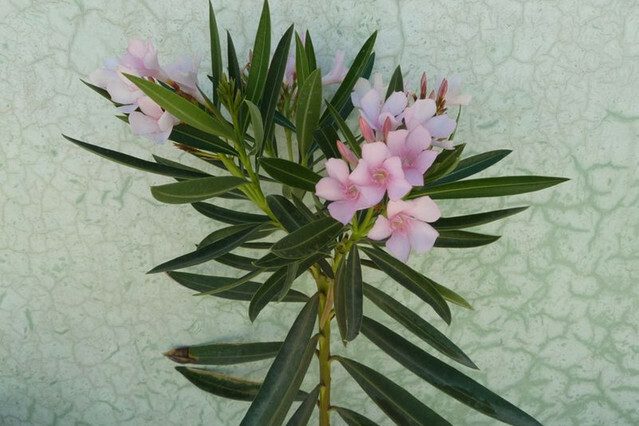 The house is the home of bougainvillea, hibiscus, cactuses, orange trees, laurels and palms trees. 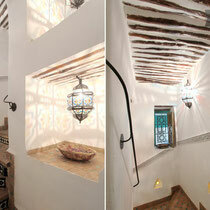 - «Souks», 5 min walk. 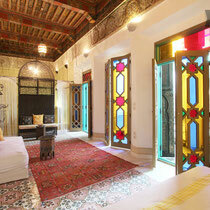 - «Jemaa El Fnaa» square, 7 min. 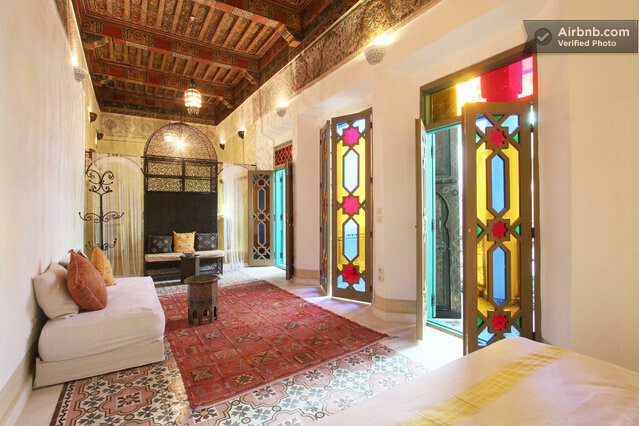 - «Palais Bahia» and «Palais Badii», 3 min. 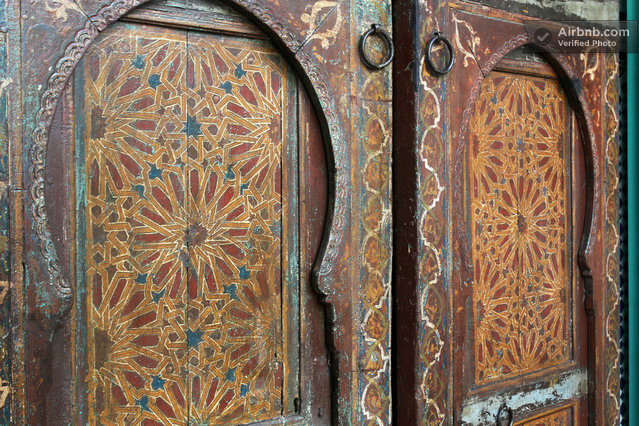 - «Musée de Marrakesh», 15 min. 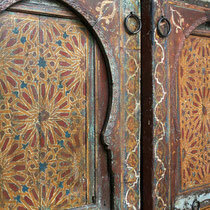 - «Medersa Ben Youssef» (old Koranic university), 15 min. 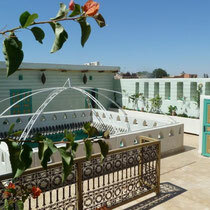 - Restaurant/bar: «KosyBar» (beautiful roof terrace), 2 min. 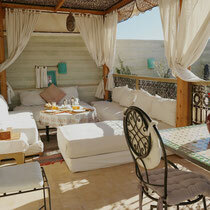 - Restaurant: «Tanjia» (with belly dancing), 2 min. 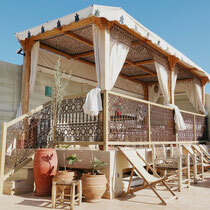 - Restaurant/bar: «Café Arabe» (beautiful terrace), 15 min. 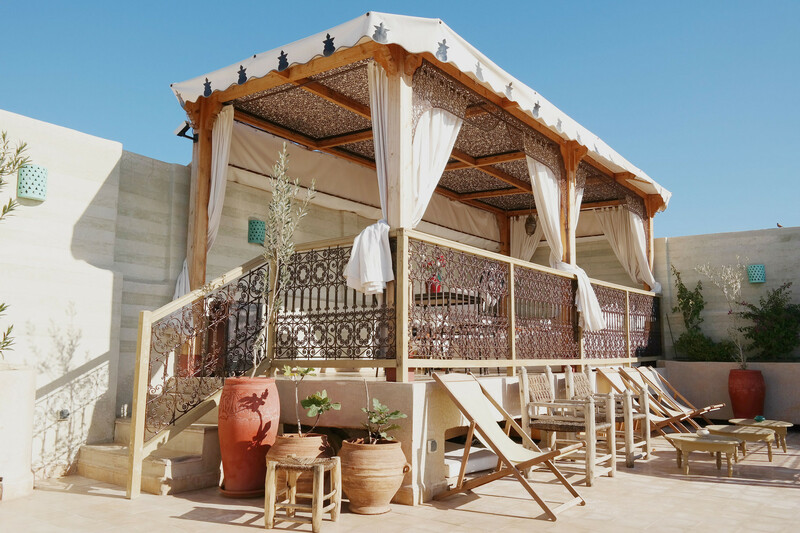 - Restaurant: «Terrasse des Épices» (large terrace), 15 min.